Subject: Why Is Stock Market Volatility So High? For the past month, stock market volatility – the extreme swings in stock prices and market indexes – has unnerved investors. 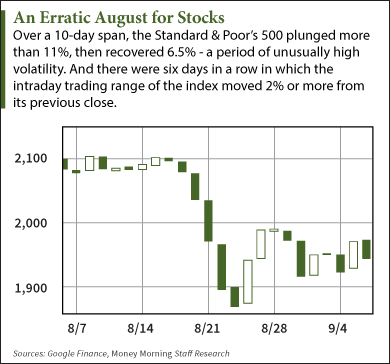 In one 10-day span, the Standard & Poor's 500 Index shed 11% – then rose 6.5%. And on Aug. 24, the Dow Jones Industrial Average plunged 1,000 points before recovering. It's been enough to give any investor vertigo. But why is stock market volatility so high? And what can investors do about it? The reasons are complex and, as you might expect, interrelated. We break them down here – and give you a couple of profit tactics for volatile markets. While the U.S. economy is faring somewhat better, most the rest of the world is in economic turmoil. Commodities markets have collapsed. China suffered a stock market crash. Emerging economies that had been key sources of growth, such as Russia and Brazil, have hit a wall. Europe continues to struggle with the Greek debt crisis. All those concerns add up to a big heap of fear and uncertainty – a stock market's worst enemy. Economic problems around the world have led central banks to drop interest rates and launch their own versions of the U.S. Federal Reserve's bond-buying quantitative easing policy. Those policies, aimed at boosting economic activity and raising interest rates, have mostly failed. Instead, they've ramped up fears of a global currency war. Investors have grown increasingly anxious as it has become clear the central bankers have no answers. Meanwhile, the U.S. Federal Reserve has spent months dropping hints that it will raise interest rates before the end of the year. Addicted to years of easy money, Wall Street has dreaded this moment. But the real issue now is figuring out when this will happen. Unclear economic data and contradictory statements from Fed governors have burdened traders with yet more uncertainty.